LOS ANGELES – June 7, 2012 – Gamania Digital Entertainment Co. Ltd. today unveiled new gameplay for their upcoming action MMO title Core Blaze with a video and in-game screenshots as part of a private press event taking place in downtown Los Angeles. 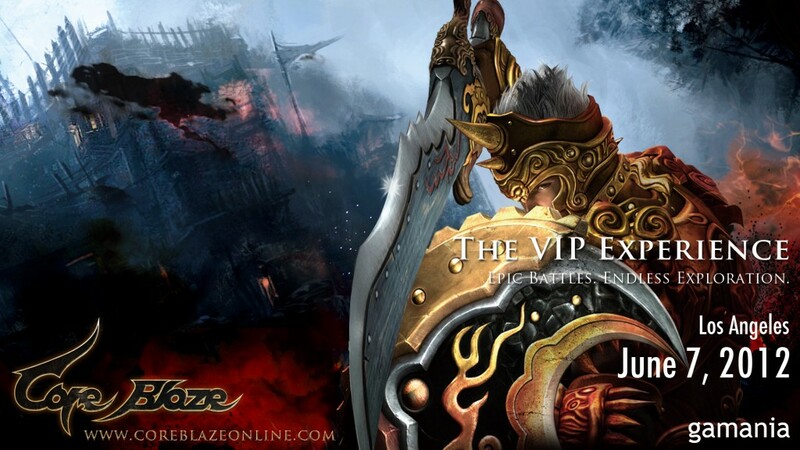 The event, “Core Blaze: The VIP Experience,” is being held at loftSEVEN Penthouse and will showcase an exclusive build for the first hands-on opportunities with the game. Additionally, the event features cosplay models, a gallery with concept art from Core Blaze and a large-scale crossbow modeled from one of four major game weapons, which was designed by a local Los Angeles metal sculptor with works on display at the ARIA and the Hard Rock Café in Las Vegas. “Core Blaze: The VIP Experience” marks the first time that Core Blaze has traveled overseas to the U.S. to offer global gaming enthusiasts a chance to experience its unlimited degree of freedom and exploration within a vast, vivid landscape utilizing the Unreal Engine 3. It was previously only shown during the September 2011 Gamania Game Show in Taipei. Two new settings will be revealed at the U.S. event, the “Forest of Meditation” and the “Anima Village”, as well as two new bosses, the “Fake Mountain God” and the “Dolar Fiend”. Carrying almost all the features of the game when it is officially released, the exclusive demo shown at “Core Blaze: The VIP Experience” will highlight how freedom of choice in combat and weapons will determine each unique gameplay experience, teamwork and how it factors into strategy and outcome, and the endless exploration of characters, skills and the world. For any last-minute media RSVP requests to the event, please contact gamania@triplepointpr.com. Customization is a key feature in Core Blaze as it dynamically alters the gameplay experience. The player’s current level, choice of combat style and weapons, geography and map environment, monsters’ element, and even the weather and time of day all contribute to the effectiveness of each attack. Changing any factor produces a new quest line and outcome, which will change the player’s strategy, even when entering the same map at a different time of the day. Quests are designed for teams of up to four players to emphasize the game’s heavy reliance on teamwork. Players need to instantly react to each other’s combat style in order to achieve the most effective results. Instantaneous strikes, attack tempo, angle of attack, and even the compatibility with team members, are critical in achieving success in the game, especially during combat with the two new bosses. Players will have a chance to explore game characters by equipping them with four different weapon styles between battles: sword and shield, great sword, dual blade, and long bow. This allows for strategic adaptation to difficult and unpredictable events in a world that changes in real-time based on player actions. Side quests also change based on progress, weather, and time, so players may face completely different situations in the same location, be it “Anima Village” or “Forest of Meditation”.